By conservative estimates there are over 500 Beatles Tribute Bands around the world. As you might imagine, the majority fall into the garage band to semi professional catagory. There are probably less than a dozen who are nationally touring, fully professional and credentialled bands that have proven themselves to be at the top of their games when it comes to production and execution of their high caliber Beatles Tribute shows. Where a Beatles Tribute Band has played will give you a good indication of their experience and level of professionalism. Look at the pictures on a Google search or on their website. Does the band play at theaters, large festivals and upscale casino rooms, or do they mostly play bars and community park district events. How does the band look? Tailored costumes and professional equipment? Pictures and past performances will help you a lot in determining the quality of the Beatles Tribute Band you are hiring. Be sure to know exactly who you are hiring. Many Beatle Tribute Bands work off the 'rolodex method'. Meaning, they do not have a main cast of players that represent the band. Instead, when they get a gig, one person gets on the phone to see who they can get to fill that particular date with other players. That usually means a subpar performance. 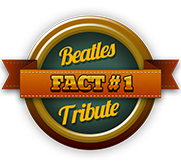 You will always get the best Beatles Tribute Band performance when hiring a band with a main cast that regularly plays and rehearses together and is represented on that band's website. Sgt. Pepper's Lonely Hearts Club Band is the eighth studio album by the English rock band the Beatles. Released in June of 1967, it was an immediate commercial and critical success, spending 27 weeks at the top of the albums chart in the United Kingdom and 15 weeks at number one in the United States. Time magazine declared it "a historic departure in the progress of music" and the New Statesman praised its elevation of pop to the level of fine art. It won four Grammy Awards in 1968, including Album of the Year, the first rock LP to receive this honour. In August 1966, the Beatles permanently retired from touring and began a three-month holiday from recording. During a return flight to London in November, Paul McCartney had an idea for a song involving an Edwardian era military band that would eventually form the impetus of the Sgt. Pepper concept. Sessions for what was to become the Beatles' eighth studio album began on 24 November in Abbey Road Studio Two with two compositions inspired from their youth, "Strawberry Fields Forever" and "Penny Lane", but after pressure from EMI, the songs were released as a double A-side single and were not included on the album. In February 1967, after recording the "Sgt. Pepper's Lonely Hearts Club Band" song, McCartney suggested that the Beatles should release an entire album that would represent a performance by the fictional Sgt. Pepper band. This alter ego group would give them the freedom to experiment musically. During the recording sessions, the band endeavoured to improve upon the production quality of their prior releases. Knowing they would not have to perform the tracks live, they adopted an experimental approach to composition, writing songs such as "With a Little Help from My Friends", "Lucy in the Sky with Diamonds" and "A Day in the Life". Producer George Martin and engineer Geoff Emerick's innovative recording of the album included the liberal application of sound shaping signal processing and the use of a 40-piece orchestra performing aleatoric crescendos. Recording was completed on 21 April 1967. 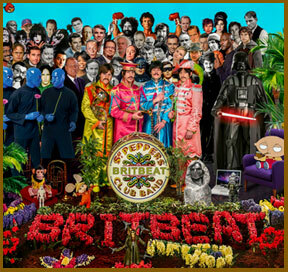 The cover, depicting the band posing in front of a tableau of celebrities and historical figures, was designed by the British pop artists Peter Blake and Jann Haworth.